It was two weeks ago since my last update... where did all that time go? Well, on that said Thursday, face2face called me and I got the job, that's eight weeks of summer that I know what to do with. And then, on Saturday, my family came for a visit. That was an intense week (even though we didn't do much). Four pictures to recap the whole thing. We had a lot of deliscious food. 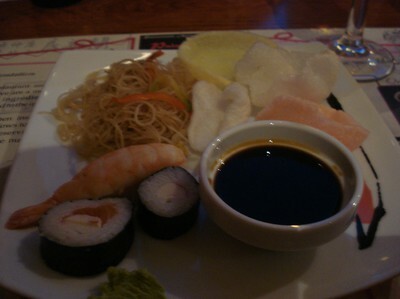 Lots and lots of tapas, but also pasta, meat, sallad, pitas and least but most important sushi! Even though I love tapas (which I do) sushi was the highlight in the food area. We had a lot to drink aswell. A lot of cañas (and I had no idea that it means tap beer, I though it just was a small beer) I can really recomend the sangria at cheers (even though the name indicate that you should drink beer there). Me, my brother and Mr. M even manage to get out two times, on Saturday and on Wednsday and that included a lot of good drinking aswell, but I fell a little short on the pciture taking. Of course we did some sightseeing aswell. 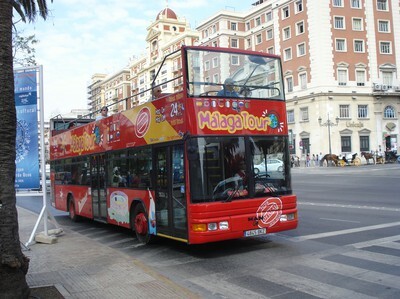 Here's the bus we took around town. We went all the way up to Castillo Girbralfaro, where I had never been before and it was wuite cool and puzzling (how, why and what?). We didn't really do that much more sightseeing (my parents went into the cathedral and walked along the beachwalk) and we definitly missed a lot of nice stuff. Well, next time. 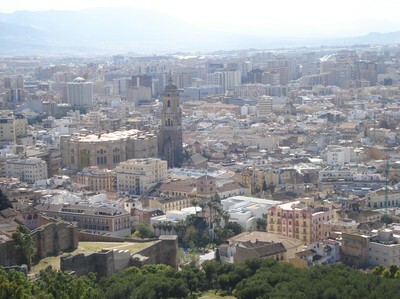 This is the view from Gibralfaro (You see the cathedral, which I live closely to, almost in the middle of the picture). We also went two time to the beach. On Thursday the following week, I found myself all alone. My family went back home, Mr. M on a trip to London and even my roommates had deserted me for going to Barcelona. It was confusing but it gave me a chance to breathe out and I spent the entire weekend in front of the tv and computer eating candy. That starts us on this week and it is already Wednsday. As time progress into the summer, it doesn't really slow down. On Saturday I'm attending a wedding and then (19 of may) a couple of best friends from Sweden are visiting me and then time is just gonna float by until that dreadful flight to Sweden.